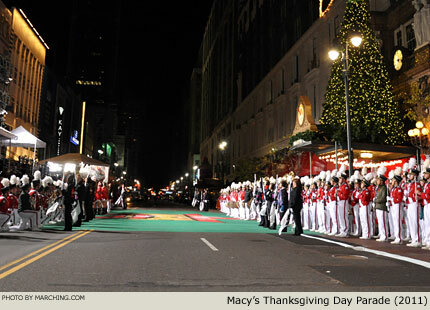 On parade day more than a year later, Marching.com reconnected with Dobyns-Bennett and all the other bands in New York Citybeginning with their 3:00 AM rehearsalsto get a first-hand look at the experience marching bands have performing in one of America's greatest parades. Dobyns-Bennett band members are on deck and ready to rehearse their show for the NBC telecast crew. The shivers and yawns are understandable ... it's about 40 degrees and the students had only a few hours of sleep. Just a few steps away from the famous green performance area, Macy's creative director Wesley Whatley and Dobyns-Bennett band director Lafe Cook give the banner carriers precise instructions at the starting line. 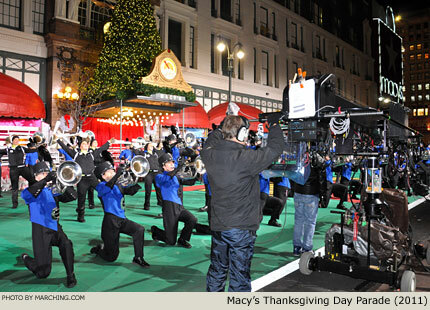 Lights, cameras and two monitors flanking the "center line" sign are what band members see as they perform their run-through. Dobyns-Bennett exits the broadcast area. They ran the show one-and-a-half times ... the first halt ended slightly off-center, so they made a quick adjustment and re-entered for a full run. Band member Nneka Jones said, "I expected it to be very good and it was. The whole band was great." Homewood H.S. (Alabama) completes its rehearsal. 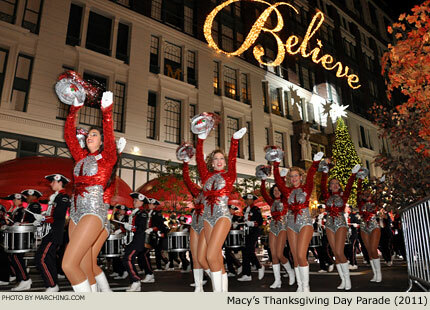 The massive "Believe" logo standing more than two stories tall on the Macy's building is one more indicator of the grand scale of this event. Just like clockwork, Nation Ford H.S. (North Carolina) is finishing its run-through. The morning is tightly scripted with each band getting in and out in less than ten minutes. 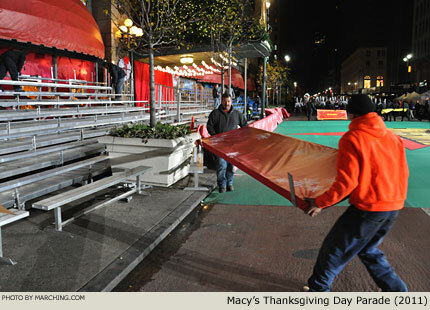 A crew completes the setup of VIP bleacher seating while Plymouth-Canton Educational Park (Michigan) is at the starting line ready to begin. Plymouth-Canton has created an elaborate production complete with The Grinch and guard members wearing "Whoville" hair styles. 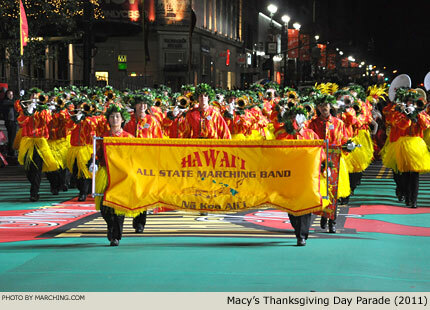 As an all-state band representing 40 high schools and four Hawaiian islands, the Hawaii All-State Marching Band did not rehearse together as a full group until arriving on the mainland four days before the parade. Carmel H.S. 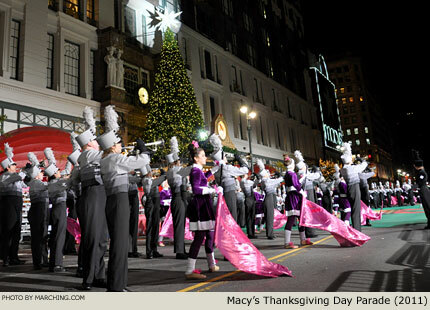 (Indiana) produces an excellent sound during its rehearsal and is a reminder of the great caliber of bands assembled for Macy's Parade. Just 12 days ago Carmel earned the bronze medal and placed first in music at the Bands of America Grand National Championships. Legacy H.S. 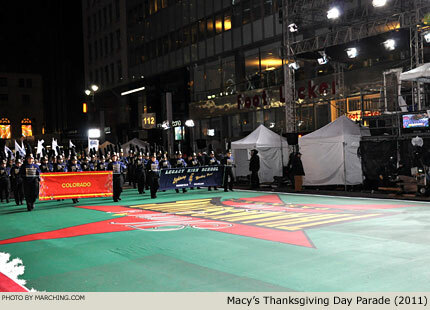 (Colorado) steps out of darkness into the bright lights for its run-through. 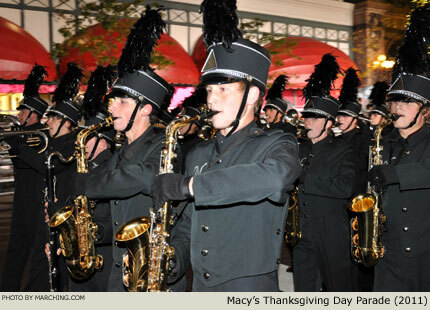 Bands represent not only their hometowns, but also their entire state as Macy's typically invites only one band from any state each year. As this year's "Santa Band," Miami University (Ohio) ends in a formation that will allow the float carrying Santa to pass through.